Well, last week was fun but I think it’s time for a return to form. 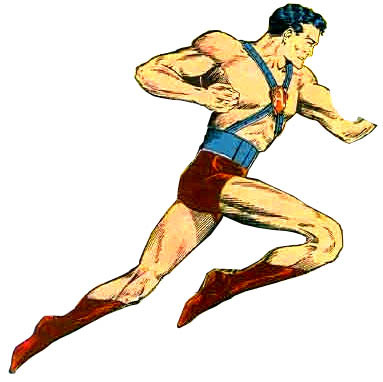 Let’s talk about an obscure comic book hero from an obscure comic book publisher who had more of an impact on the world of comics than he had any right to have. 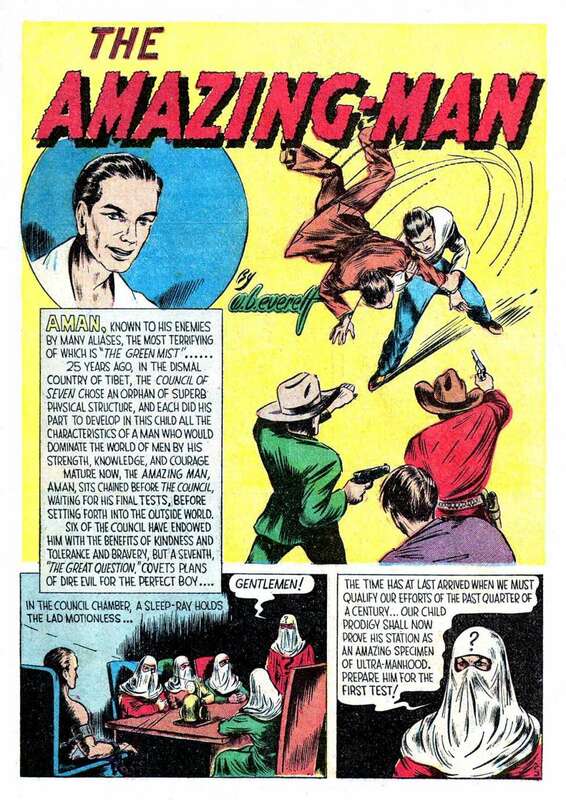 Today we’re talking about the aptly named Amazing Man. 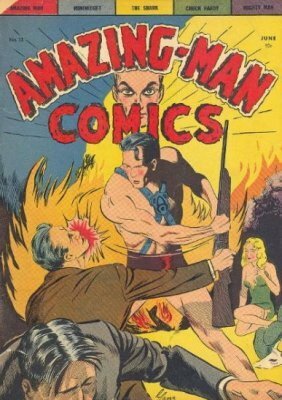 Amazing Man was one of the greatest and most noteworthy heroes to come out of a small publisher called Centaur Publishing, mostly because he was created by comic book super creator Bill Everett. 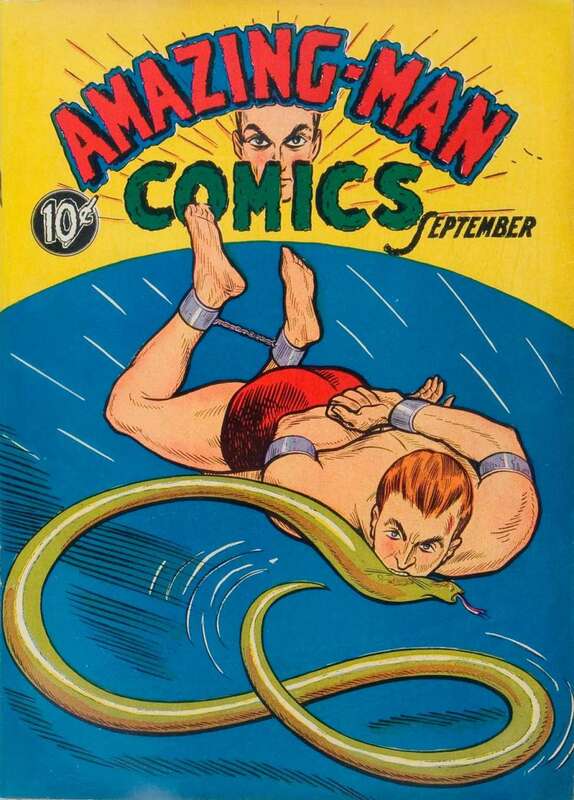 Centaur was a spin off company created by two former employees of National Allied Publications, the company that would eventually become DC Comics. 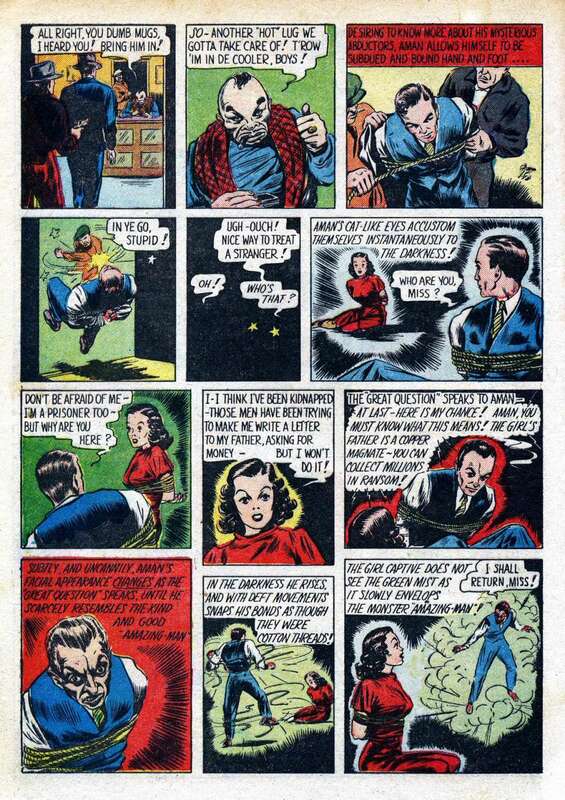 They were actually one of the first comic book publishing companies in American history and in 1939 they debuted Amazing Man in the creatively named Amazing Man Comics #5. Now, I’ve seen some covers created by some of the greatest comic book talent and while this one isn’t as colorful or as action packed as most of them, it certainly does a hell of a lot to pique my interest. In traditional Golden Age fashion, his backstory is explained in one page. When he was a baby he was adopted by a group of monks and trained to be their instrument. 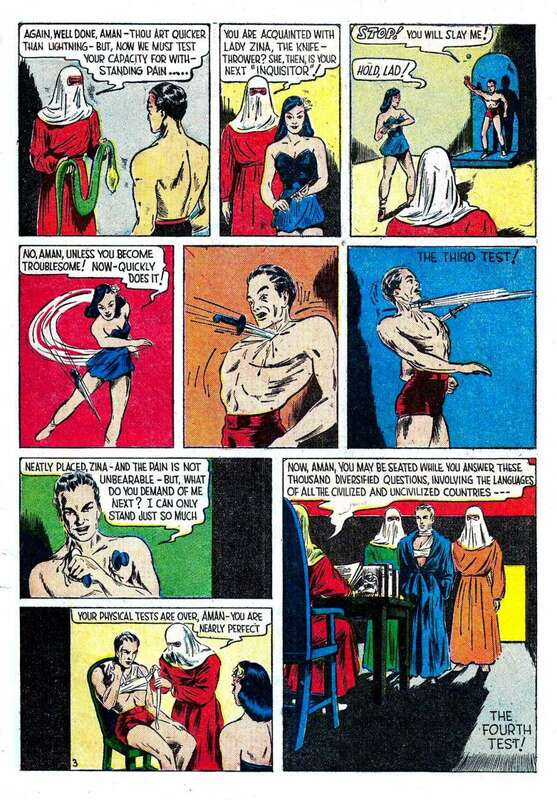 I love how they call him an “ultra man” and how a group of Tibetan monks look so pale and white. I honestly don’t know which one I think is more awesome. 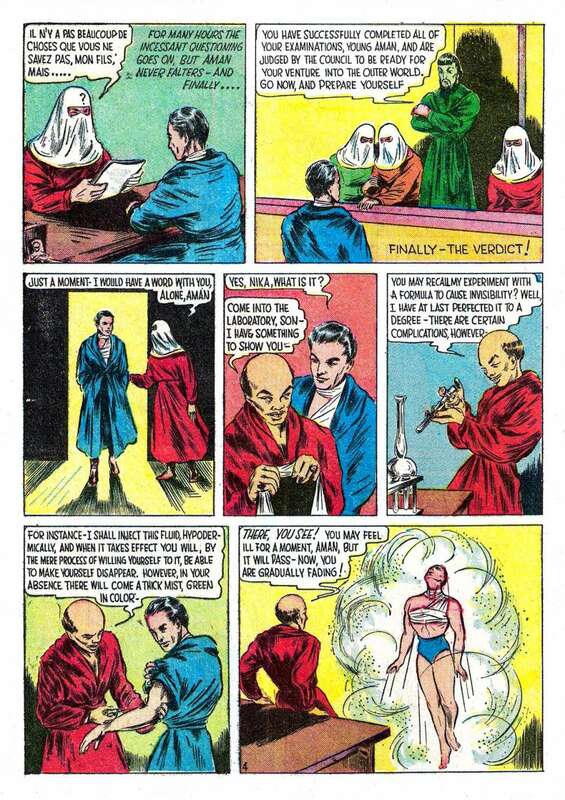 Almost as a side note, one of the monks injects him with a serum that turns him into a green mist. 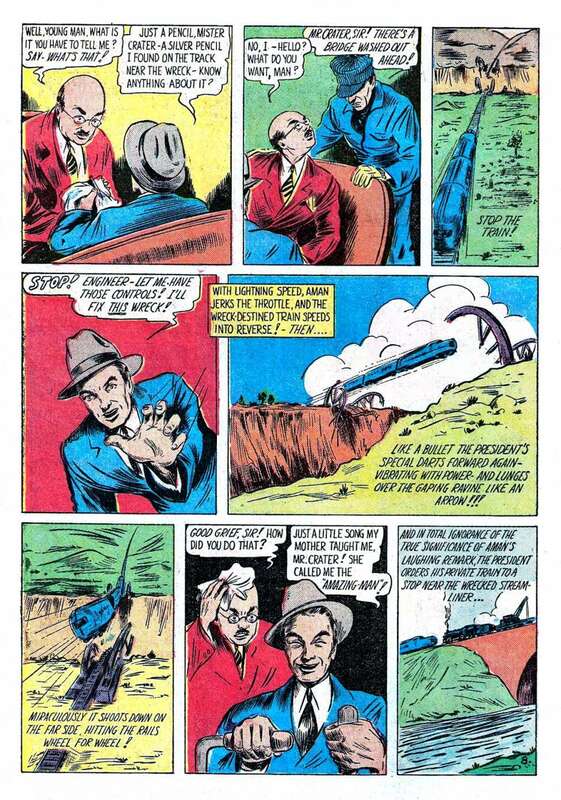 He goes out into the world and stops his first crime by uncovering a conspiracy by a greedy railroad president to wreck his trains but not before our hero uses his unexplained powers of telepathy to boost a moving train over a washed out bridge. It’s like the movie Speed, only with trains instead of buses. It’s presumed that the President of the railroad company did it for insurance money, but the reason is never given and the story ends with the criminal committing suicide rather than being captured. There was an interesting plot point revealed early on that actually managed to separate the Amazing Man from the competition. Early in the series it was revealed that one of the monks from The Amazing Man’s home turned out to be evil. What’s really interesting is that Everett didn’t shy away from violence, showing people getting beaten and even shot. 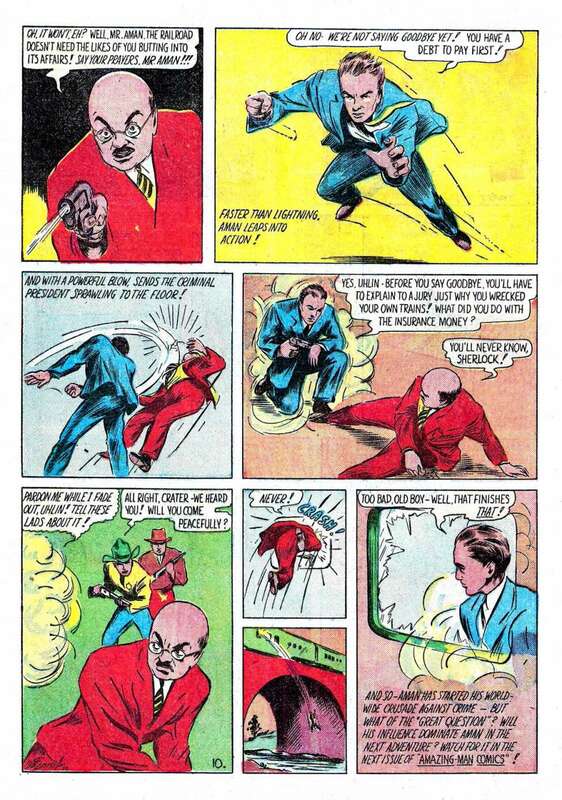 The battle between Amazing Man and the Great Question would become the defining conflict of the series until it was cancelled in 1942. Most of the adventures were pretty run of the mill, if it weren’t for the glorious covers that were featured on almost all of the issues. One of the defining traits of comic book publishers during the Golden Age was that, with the exception of Marvel and Detective Comics, a lot of them wound up either going out of business or folded into other publications. Centaur Publications is a rather unique story because it’s shelf life was even shorter than most of its competitors. Thanks to a bad distribution deal the company went out of business in 1942, they didn’t even get to see the end of the war. 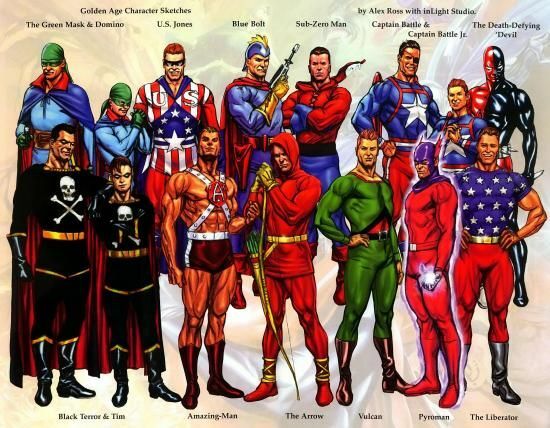 Someone must have remembered them, because in 1992 a good portion of their characters were revived by another comic book publisher called Malibu Comics. complete with all the trappings and glorious excess that was a hallmark of superheroes in the 1990’s. In a sad twist of fate, Malibu Comics would suffer the same fate as Centaur. They fell victim to the skulduggery surrounding the comic book industry of the 1990’s and were bought out by Marvel in 1994.
but what’s really interesting is how his legacy managed to live on in Marvel Comics itself. 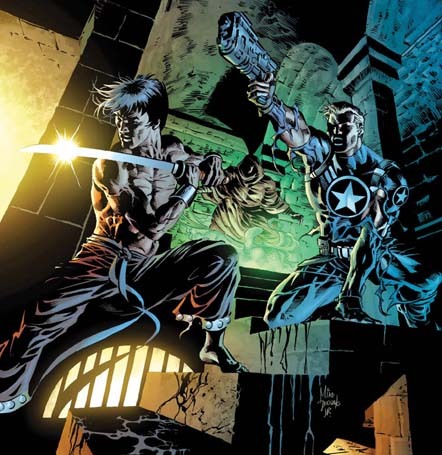 John Aman would make an appearance in the Invincible Iron Fist #12 in 2008. 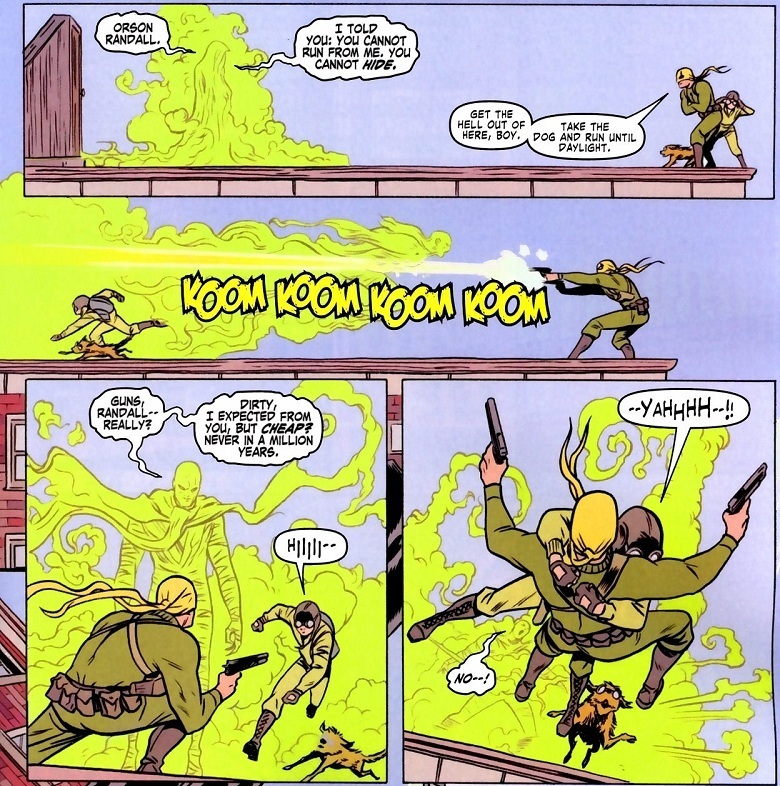 Marvel kept the name, the ability to change into a glowing green mist, and his mystical connections to Tibetan culture by having him become the “Prince of Orphans” and being charged with hunting down a character named Orson Randall, the man who was the Iron Fist superhero before Danny Rand took over. Long story short, Orson and Aman are originally enemies but wind up fighting for the same side when Aman learns that his employers lied to him about their plans for their city and Earth. the Marvel event comic Fear Itself, where he had to fight a possessed Iron Fist in order to save the universe, and most recently as an antagonist in the 2012 Defenders series. 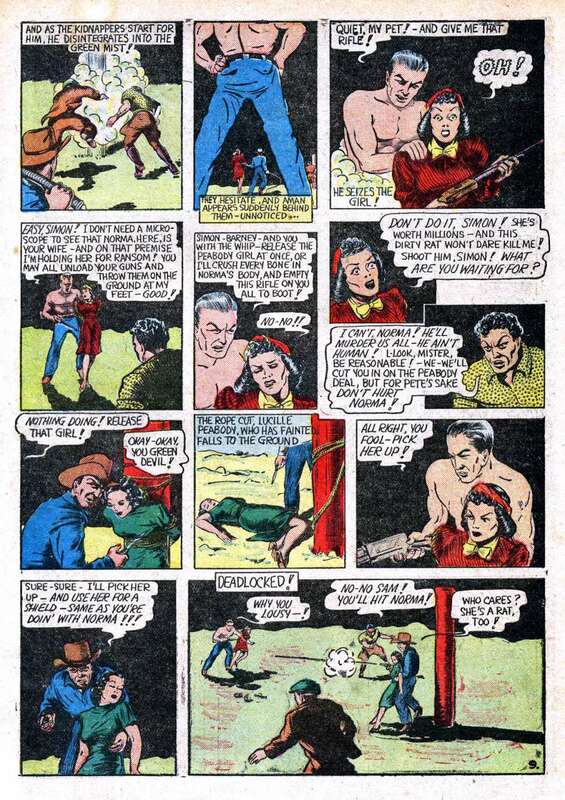 So what we have here is a revamped Golden Age superhero with ties to Tibetan mysticism, who is a brilliant martial artist who can turn himself into a green mist, and who winds up being a sort of assassin for the same mystical city that created Iron Fist. Now, I don’t want to put thoughts in anyone’s head, but don’t you think a guy with a cool power set would be perfect for a certain set of shows on a tiny little network like say…Netflix? All I’m saying is that there’s a lot of history to go back on here, and while I haven’t gotten around to watching the Iron Fist show on Netflix, everything I’ve heard tells me that they could use something a bit more…amazing. 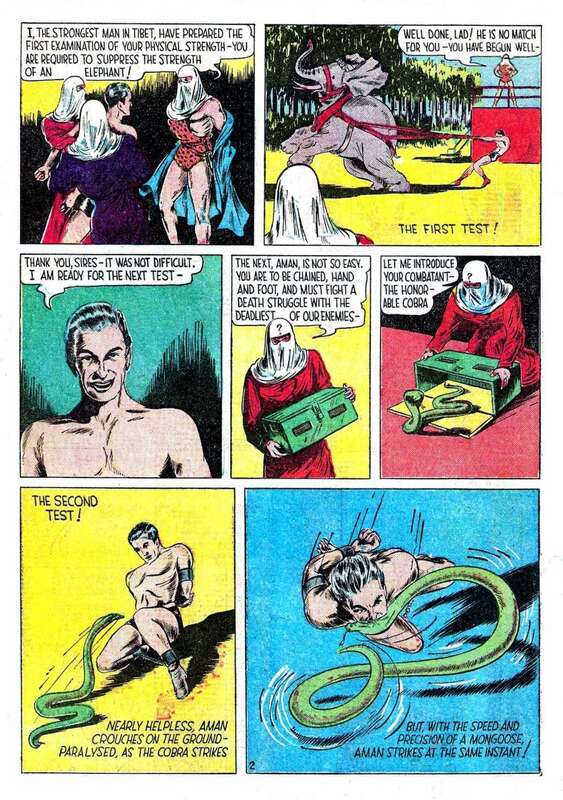 This entry was posted in Blog and tagged Amazing, Amazing man, Bill Everett, Centaur Comics, Centaur Publication, comic, comic book, comic books, comicbook, comicbooks, comics, creator, DC, Defenders, elephant, Green, green mist, Image comics, Iron Fist, Malibu Comics, Marvel, mist, monks, Netflix, snake, super, superhero, superheroeres, televison, Tibet, tv, web, web comic, web comics, webcomic, webcomics. Bookmark the permalink. A really interesting read on an almost forgotten character.